The late-Victorian and Edwardian East End was an area not only defined by its poverty and destitution, but also by its ethnic and religious diversity. In the neighbourhoods of East London diasporic communities interacted with each other and with the host society in a number of different contexts. 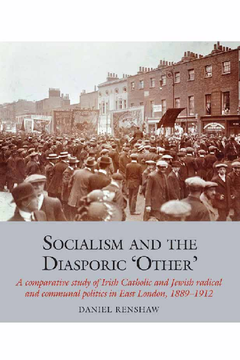 In Socialism and the Diasporic ‘Other’ Daniel Renshaw examines the sometimes turbulent relationships formed between Irish Catholic and Jewish populations and the socialist and labour organisations agitating in the area. Employing a comparative perspective, the book analyses the complex relations between working class migrants, conservative communal hierarchies and revolutionary groups. Commencing and concluding with waves of widespread industrial action in the East End, where politics were conflated with ethnic and diasporic identity, this book aims to reinterpret the attitudes of the turn-of-the-century East London Left towards ‘difference’. Concerned with both protecting hard-won gains for the industrial proletariat and championing marginalised minority groups, the ‘correct’ path to be taken by socialist movements was unclear throughout the period. The book simultaneously compares the experiences of the Irish and Jewish working classes between 1889 and 1912, and the relationships formed, at work, at worship, in political organisations or at school, between these diasporic groups.